For more than 20 years Dr. Hans Prader, Dean of the Alternate Executive Directors of the International Monetary Fund (IMF) in Washington, D.C., has represented Austria and other ten member states of the Constituency on the IMF Executive Board. 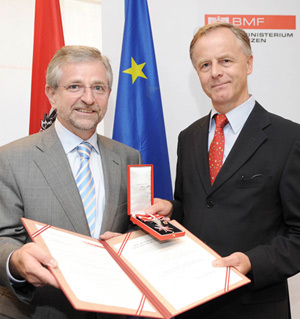 In recognition of his high degree of commitment and successful achievements Dr. Prader was recently honored with two outstanding decorations: On July 11, 2008 Austrian Vice Chancellor and Federal Minister of Finance Wilhelm Molterer presented him with the Grand Decoration of Honor in Silver for Services to the Republic of Austria. Recently he was awarded the title “Commandeur” of the “Ordre de Mérite” by the Grand Duke of Luxembourg and was presented this award by Luxembourg’s Prime Minister and Minister for Finance Jean Claude Junker on October 13 in Washington, D.C.
Born in 1951 in Rossbach, Austria, Dr. Prader, earned a PhD in Political Science and Sociology from the University of Salzburg. He completed additional studies at the University of Vienna (Economics) and the University of Warwick in Great Britain, in addition to courses in Macroeconomics and Finance at the International Monetary Fund (IMF). In 1976 Dr. Prader joined the Central Bank of Austria (Österreichische Nationalbank), initially dealing with international economic issues and representing the Austrian Central Bank at the OECD. Since 1987 Dr. Prader has been assigned by the Austrian Central Bank to Washington, D.C. as the Alternate Executive Director of the International Monetary Fund for the multi-member constituency of Belgium, Austria, Luxemburg, Hungary and Turkey, which was further enlarged in 1990 to include Belarus, Kazakhstan, Slovak Republic, Czech Republic and Slovenia. This Constituency represents the strongest voting block in the IMF, and Dr. Prader chairs the fourth largest group on the Executive Board. Since this time Dr. Prader has represented the ten member states of the Constituency on the IMF Executive Board. He also represents Austria at the annual consultations with the IMF in regard to Austria’s currency and financial policies. During Eastern Europe’s transition to a free-market system he helped establish the IMF educational center (“Joint Vienna Institute”) in Vienna. Since 1991 more than 18,000 public officials, parliamentarians, ministers and governors from Eastern Europe, the former Soviet Union, Asia and North Africa have received training in Vienna. Dr. Prader also and participated in negotiations and discussions on economic policy during financial crises in Latin America, Asia and Russia. Dr. Prader is considered one of those responsible for strengthening European cooperation within the IMF. During Austria’s EU-Presidency in 1998, he was able to further Europe’s and Austria’s interests in reforming the IMF’s financing mechanisms and with the negotiations involving the organizational implications of the European Monetary Union. Euro-area consultations were established as well as a European Central Bank observer was assigned to the IMF. From 2005-2006, he was the Euro Group President at the IMF, representing the Euro country members on the Executive Board during consultations regarding the Euro region. He also served two times as president of the European Representation at the IMF (EURIMF) in 1998 and 2006, and since 1995 as Dean of the Alternate Executive Directors of the IMF.